A unique wildlife safari to track down some of our Highland residents in winter and find out how they cope with the conditions. Surprisingly enough they don't all hibernate! Our destination is Carn Dulack and the 10,000 acre Site of Special Scientific Interest on the Ladder Hills. 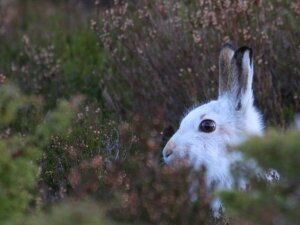 Winter residents include Mountain Hare, Roe Deer, Red Grouse, Raven, Snow Bunting, Waxwing and Golden Eagle. 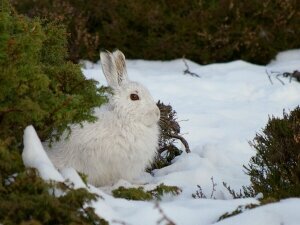 Discover how these hardy species search out food and survive the Cairngorms winter. Leaving the public road at Eskmullach, we pass the Forbidden College of Scalan before reaching the Ladder Hills SSSI. 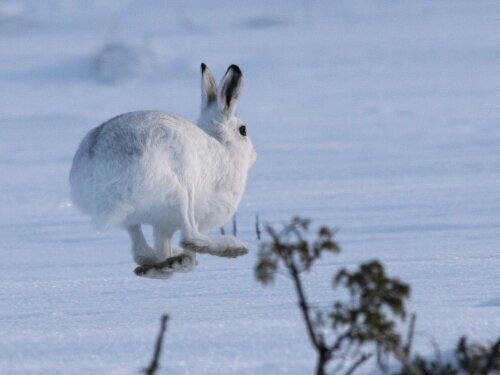 The greatest risk for sleeping Mountain Hare is becoming a Golden Eagle's dinner. So they choose the juniper clad northern slopes of Carn Dulack as a safe dormitory because of its excellent cover. A walk of a kilometre or so amongst the junipers on this Scottish hillside frequently enables us to get close to these hardy residents of the Cairngorms. During winter Mountain Hare sleep during the day. By late afternoon they begin to wake up feeling hungry. Emerging from cover they often feed for a while before ascending to higher ground for the night. Bring boots and warm clothes because it can be cold in the Cairngorms in winter and there may be deep snow. If there are adverse snow conditions we reserve the right to vary the route on the day. What we can be sure of is that our wild residents will be out there making a living at this time of the year. 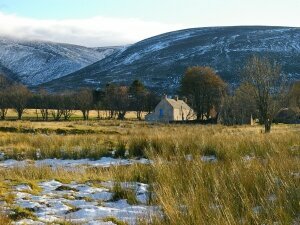 Enjoy a distinctive wildlife experience in the stunningly beautiful winter white scenery of Glenlivet and the Cairngorms.